The cellulose insulation in this attic was installed at a uniform depth. I love insulation. It’s a wonderful thing because it saves energy. It makes buildings more comfortable. And it’s pretty inexpensive considering how long it lasts (or should last). I get asked a lot for my opinion on the best insulation to put in a building and my answer is straightforward: A well-installed insulation is the best. I like fiberglass. I like cellulose. I like spray foam. I like mineral wool. I like blown, sprayed, batt, and rigid insulation. Yeah, different materials have different properties, with their advantages and disadvantages. But if it’s installed well and protected by good water and vapor control layers, it should do its job for a long, long time. Way back in 2011 I wrote an article called “Is There a Downside to Lumpy Attic Insulation?” I refer to it now and then but it’s important enough to make it the highlight of this article. The point of the article was that if you install insulation uniformly, as in the lead photo above, you’ll get much better performance than from insulation installed (or later disturbed) like you see in the photo reproduced as Image #2 at the bottom of the page. Flat beats lumpy. .. AND WOULDN'T AIR FLUFFING BE AN ISSUE, AS WELL? Excellent article, Allison...as you had mentioned a situation that I wasn't fully aware of. 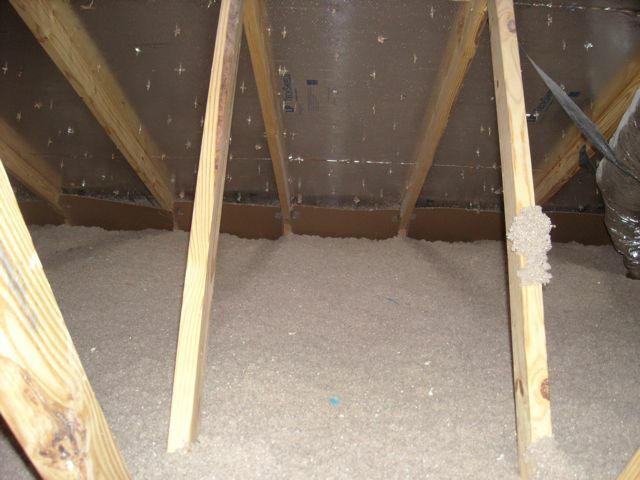 If you hire a contractor to install loose-fill fiberglass insulation in your attic, you might need to worry about fluffing. That's another reason why you might want to specify cellulose instead of fiberglass -- cellulose can't be fluffed. 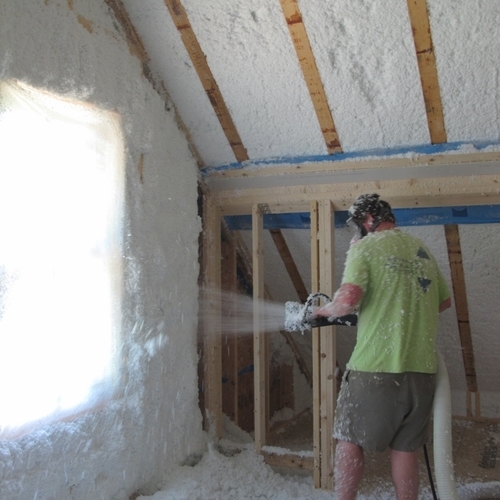 "The reputation of blown-in fiberglass has been hurt by concerns about the deliberate “fluffing” of fiberglass by some unscrupulous insulation installers. "A series of investigative reports in the late 1990s indicated that most installers of loose-fill fiberglass were mixing too much air with the fibers during the blowing process, a practice called “fluffing.” (Unlike loose-fill fiberglass, cellulose insulation can’t be fluffed.) Whether done deliberately or accidentally, fluffing benefits insulation contractors by reducing the cost of their materials. 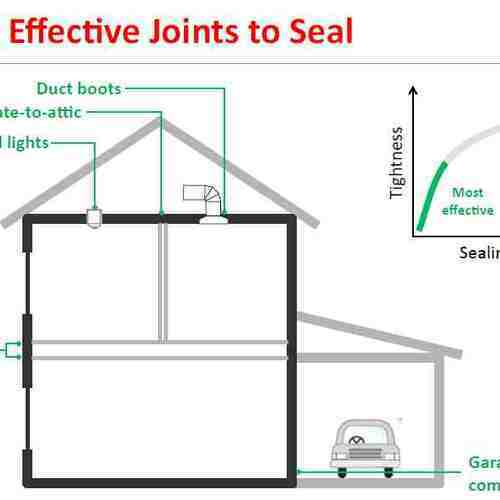 Homeowners suffer, however, because fluffed insulation has a lower R-value than properly installed insulation. "Fluffing is specifically prohibited by the federal R-Value Rule. 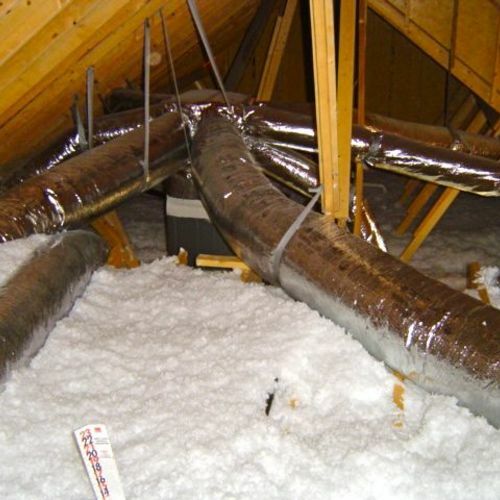 Insulation contractors are legally required to follow manufacturers’ label requirements dictating the amount of material that must be installed—the “bag count”—per square foot of attic. Wary builders or homeowners may wish to perform their own bag-count calculations—not a simple matter, unfortunately—and collect empty bags at the end of an insulation job." After a 5.5" closed cell under-roof attic insulation I found that while the main roof underside was insulated well--even covering the joists to reduce thermal bridging--it was the eaves area that didn't do so well with the infra-red test. As far as I know all the old fiberglass insulation had been removed from about the fascia inward a few feet. That should have allowed a complete fill of the closed-cell foam right to the fascia and in and around any of the 'birds mouth' areas. However I believe by either carelessness or lack of skill air pockets were left in there that made the job --in the view of a subsequent professional inspection--less than optimum. The problem is that this work--like chimney work--gets done without the homeowner being able to inspect in real time generally due to safety requirements and wanting to keep out of the worker's way. It is not an easy job. But had I to do it over again I would have donned the safety gear and watched at least that part of the process. I also wondered, if, in the dense eave and soffit-fascia area where so many joists and other wood come together, if some of the 'leakage' the infra-red sees is more likely thermal bridging from all the wood than from air pockets. I've been on a soap box for a couple years now trying to get builders and homeowners to demand more of insulation contractors in terms of verification, in attics and existing wall fills especially. It is so easy to take pictures now and you can buy a thermal camera that will do basic insulation inspection for the price of the smart phone it attaches to. With tens of thousands in equipment in the truck or trailer, there's really no excuse anymore. Builders and homeowners should be demanding pictures of the insulation work done in attics, IR of wall cavity fills, and not hiring contractors unwilling to have this done. (I'm looking at you injection foam) Unless you've contracted with a third party to do this, get a requirement of evidence in the contract up front. With wall fills, we find missed cavities with IR on every job we do and make sure they're filled before the insulator leaves. Remember that our contractor knows we're checking and is doing their best. I also regularly find low insulation in attics of new builds where the contractors know we're checking. I honestly think the process of making a record of the install might improve performance. While I had noted in the photo above, that it was, in fact, cellulose, i was mentally fixed [at the time] on fiberglass loose blow-in, since that's my current choice with my future home build. While I plan on using wet cellulose in the walls, the unconditioned attic will be loaded up with 20" of fiberglass to reach an R-value of 60. Initially felt that I would use cellulose, but was shy of using it, after reconsidering a possible water leak....due to new construction, new roof install, etc. If I recall, fiberglass was lighter per cu. ft, and is relatively unchanged if a trickle of water passes through it.. If you want to do something really stupid with the ducts for a heating and air conditioning system, put them in an unconditioned attic.